I’m sorry but I’m going to take the information with a giant grain of salt with the glaring mistake of referring to what I can only assume to be M193 55gr ammunition as “SS-109”. M855 is the US designation for the FN designed and NATO adopted SS-109. I know that it might seem to be pedantic, but if such a simple error hasn’t been corrected in all this time that I’m wondering what other uncorrected errors are in the article. I see a lot of data about barrel length vs velocity (for instance http://www.ballisticsbytheinch.com/), but very little about loudness vs barrel length. About the only test I could find was for the long barreled CZ lux 22. 20″ is sure the sweet spot for M855. I was never a big fan of shorter barrels. If a short weapon is really that important, start testing bullpups. I own an Extar 556 and CCW it in a backpack (I also carry a Sig P226). With an 8.25″ barrel, 9.25″ with flash suppressor, I will guarantee you that it puts new meaning into loud. At 100 yrs I can hold minute of paper plate, not near a rifle but I can keep it with me. Yep. It’s still a supersonic round, but with a short barrel. That’s one reason I dislike the concept of bullpup guns. How loud is your gun? Some recent testing around by folks, possibly due to the large availability of “pistol” kits being available; 10.5″ being the vanilla length usually chosen. For those so inclined there is with many loads a velocity gain for the 11.5″ out of proportion to just the additional inch. Perhaps sweet-spot for a short-gun, something Colt may have found out a long time ago. Also, for those to whom it matters, the original article I saw with that graph also included one that depicted pressure at muzzle exit/entry to a suppressor. As many add suppressors to their SBR’s, there is a noticeable drop in pressure (burden) on the can running that 11.5″ bbl, vice the 10.5. This could be nice to know as one tunes those little things to run right, which can be a rabbit hole (or warren) in & of itself. Especially so with a restrictive-type-only adjustable gas block. Not advocating for one or the other but thought that seemed like a break point of some sorts worth mentioning. 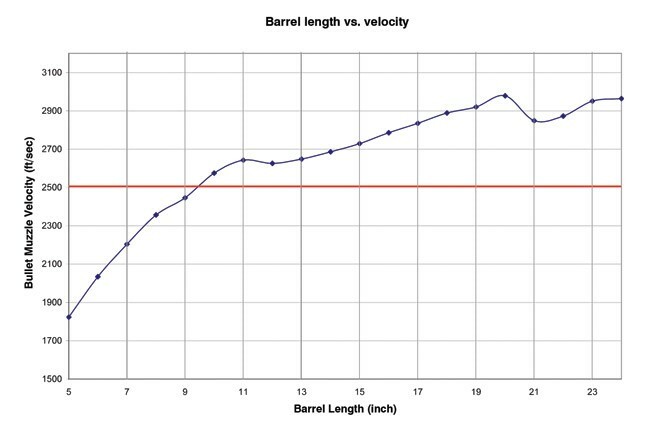 You are currently reading "Barrel Length Versus Bullet Velocity For The 5.56mm", entry #20270 on The Captain's Journal. This article is filed under the category(s) AR-15s,Firearms,Guns and was published November 25th, 2018 by Herschel Smith.